One thing I'm really rubbish at is keeping organised and tidy. 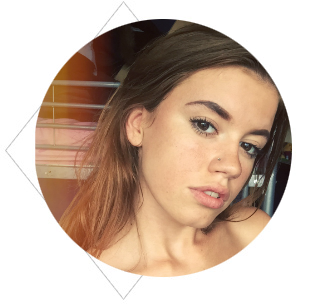 If you would have visited me the day before my exams in June, you would not have been able to get in my bedroom door due to me being waist deep in sheets, revision and stationary. I'm constantly leaving a trail of pens wherever I go (does anyone else have pens that literally run away from them? ), and I'm rubbish at keeping them all together in one place. To help me out with my untidiness, Viking Direct kindly sent me one of their desk organisers. Viking Direct is a huge online stationary shop, selling everything you could possibly want in your office or on your desk - from funky pens and desk organisation to cute office storage boxes. To visit them, click HERE. Besides the service at Viking Direct being super friendly and helpful, I was also very impressed with the fast delivery. My desk organiser took less than a day to arrive (it was dispatched on a Wednesday afternoon and I received it Thursday morning) which is exactly what you want from an online store. So often I'm left waiting for deliveries and packages that I've ordered, and sometimes they can take weeks (not ideal if you've ordered a dress to wear that weekend! ), so it was very refreshing to wake up to an unexpected package. Lots of brownie points! 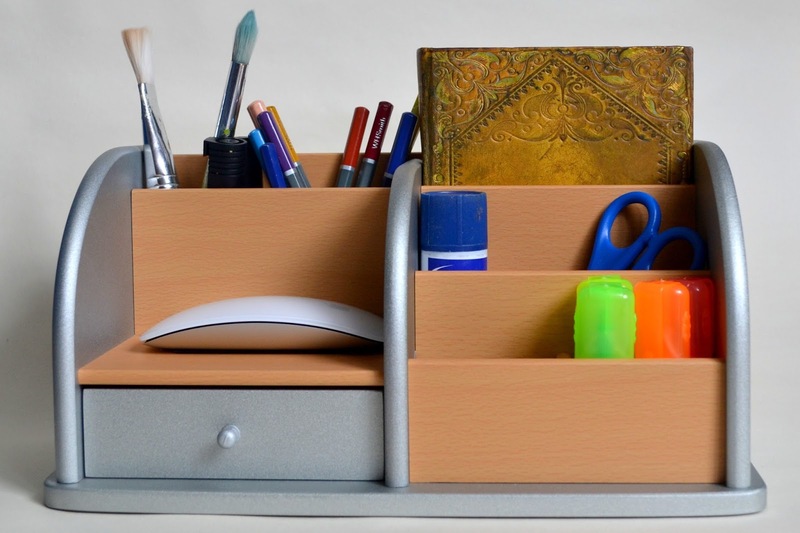 I've never bought anything quite like this desk organiser before; I've tried out little drawers that sit on your desk and pots to store pens in, but since having this I really feel like I've been missing out in the stationary world. 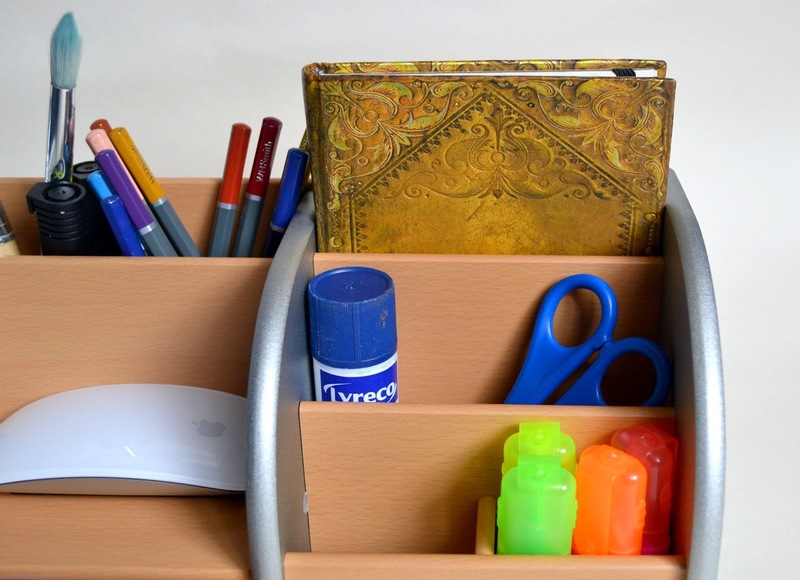 I chose the silver desk organiser as I like the light shiny finish, but there is also a black one for those of you who fancy a more sophisticated look. It looks great on my desk and I can store pretty much everything I need in it - pens, notepads, highlighters, glue sticks and paint brushes. 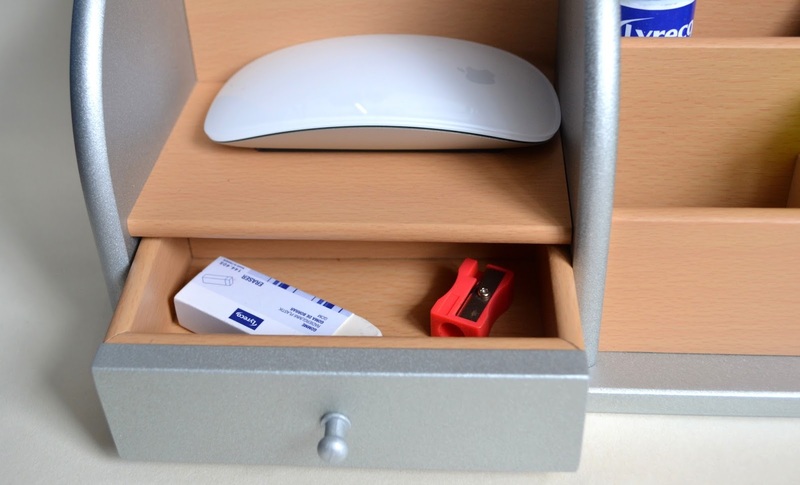 The little drawer is super handy, and very useful for storing lose bits of stationary like paperclips, drawing pins and sharpeners. If you have a desk in your room, and are weighed down with essays and assignments during school/uni time, I would definitely recommend purchasing one of these babies to tidy up your desk and keep your stuff organised. It looks good, and having everything in one place makes life so much easier. This is definitely coming to uni with me, and if you're looking for a cute, simple way to store your stationary then give this a go. To view this exact Desk Organiser click HERE. How do you store your stationary? This would have been a life saver when I was taking my exams, I was definitely in need of some organisation! It looks so good, I love the little drawer. It's so handy and helpful! I'm definitely taking this to uni with me! I love acrylic stationery personally but any little caddy like this is perfect for storing things in. Like you I'm not too good at being tidy so it's just as well places like Viking Direct have us covered! Sporting a light grey sweater layered over a white ray ban sunglasses australia T-shirt, Niall also wore a pair of blue Paige jeans. He added a pair of dark ray ban australia outlet Rayban style sunglasses and his signature platinum blonde locks were teased upwards. Enthusiastically watching the game, ray bans australia online he sipped on a cup of takeaway coffee. Its really great post! your constantly leaving a trail of pens wherever you go and I'm rubbish at keeping them all together in one place. safety management course in chennai|Industrial safety training in chennai|fire and safety courses in chennai|Iosh course in chennai|nebosh course in chennai nice post keep it up.